Political media is different than traditional media and requires specific know-how when it comes to providing payment services. 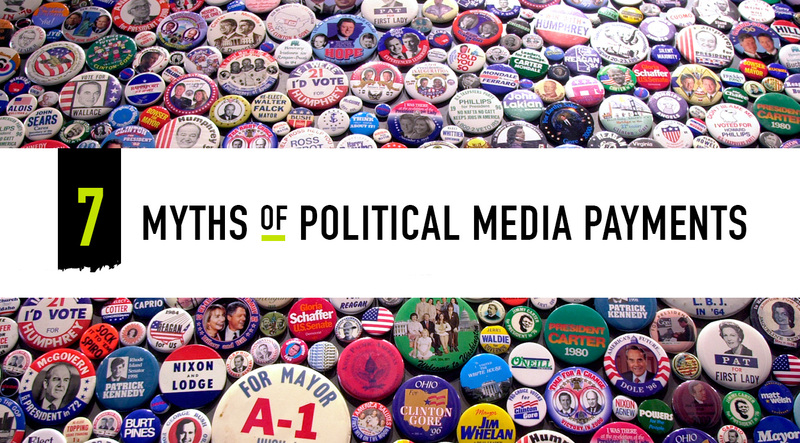 Tested over multiple campaign cycles, FastPay Political has the industry experience to identify the key myths and facts about political media payments. Fact: Maximizing supplier acceptance requires a complete and constantly updated database of suppliers, as well as methods and rules of acceptance established by every supplier. Only FastPay has TROVE, a proprietary database that has been cultivated and grown for more than 5 years. As a result, FastPay’s acceptance rates for electronic payments are 30-100% greater than all of its competitors. Fact: Quickbooks and other integrations can be easy to implement, but only a rich set of features can save time and reduce errors for the agency. FastPay’s Quickbooks integration enables clients to submit electronic payments directly from their accounting software and seamlessly updates their accounting data with remittance information. Fact: Possibly the greatest myth! The rebate percentage is an attention grabbing headline (I’m getting 2%!) but the agency is actually paid based on the 2% multiplied by the amount of throughput. FastPay can forecast the rebate for your agency so you can project how much you will earn this season. Fact: Just because a payment is emailed doesn’t mean the payment has been processed. FastPay sends remittance notifications to media reps and follows up on payments to payees, acting as an extension of the agency’s team. Follow-up and visibility into unclaimed/processed payments and payment status is available to agency personnel from within our easy-to-use online interface. Fact: Many suppliers accept payments exclusively through their own web portals. Only FastPay automates payments to these portals via SitePay, ensuring timely and accurate payments. Other payment providers either have the agency manually key the data into the portal or handle the manual entry for the agency. In either instance, a high volume of payments can burden the agency or cause the provider to run out of time. Fact: Political media planning and buying is vastly different from traditional and the same goes for payments. Prepayment, communication with suppliers, campaign data, workflow, and credit need to be customized for political media payments. FastPay Political has been tried and tested through multiple political cycles. Unlike other payment providers, FastPay is exclusively committed to media, sending and lending billions of dollars annually to agencies and suppliers. Political agencies AND media suppliers are working hard, long hours to make sure that media runs as expected. Just one missed payment or unanswered question about the campaign for which a payment is intended can have dire consequences. FastPay customers have access to a dedicated team of political media payment experts 24/7 to assist both agencies and suppliers, greatly reducing the volume of questions the agency has to field when it’s pressed to execute campaigns.